The ancient builders had helpfully indicated on some of the pieces which parts of the craft they had come from, but the work still took over ten years to complete and was finally fully re-assembled in 1968. 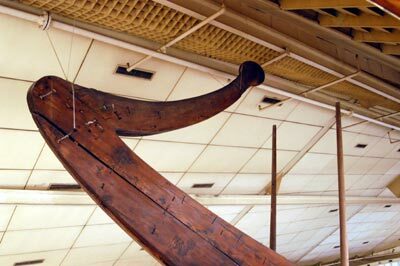 No nails were used in the construction and the planking was assembled through an ingenious system of stitching through holes with ropes of vegetable fibres. 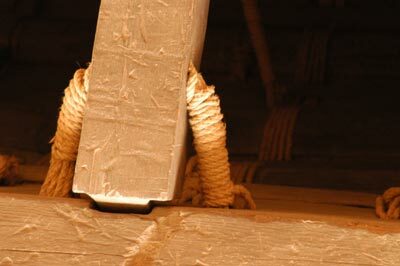 When the wood was swollen by water the ropes would tighten and make the boat watertight. 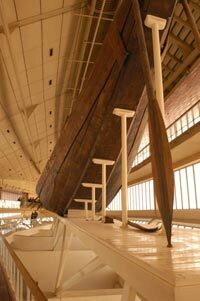 THere is some indication that the boat was actually ysed as part of the funeral processions from Abydos to Thebes -- althoygh most believe that it was built onsite and never used, more of a ritual or symbolic boat than a real one. 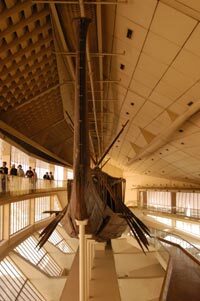 However, it contianed all the necessary pieces for a working ship, and was of the same style as boats depicted in the inscriptions.